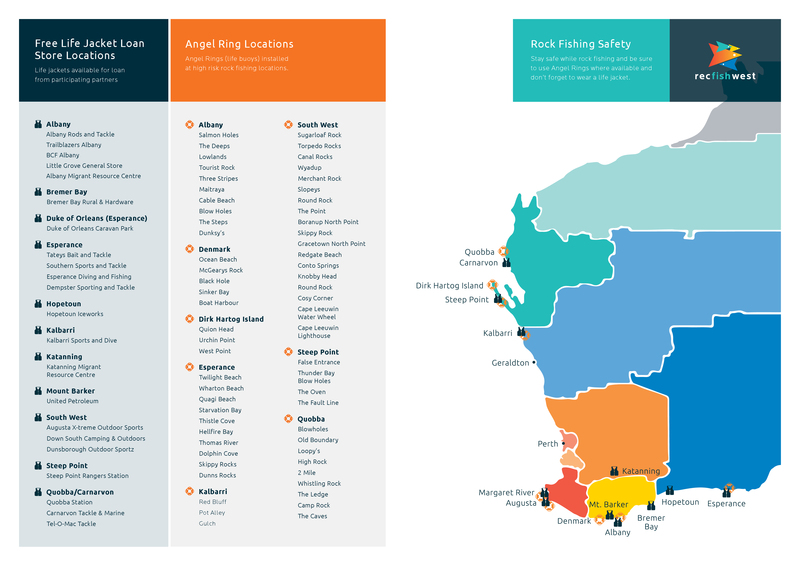 ​The State Government’s compulsory lifejacket trial at Salmon Holes, in the Torndirrup National Park near Albany, began on January 1, 2019 to evaluate if the wearing of lifejackets is effective in reducing rock fishing fatalities. This means if you’re going to go onto or accessing the rocks at Salmon Holes, it is now mandatory to wear Type 1 lifejackets, whether you are fishing or not. There is a long history of fishing related deaths and ‘near misses’ at Salmon Holes with 13 people having died since 1983 after being washed off the rocks at the notorious fishing blackspot. If you’re going onto the rocks at Salmon Holes, whether you’re fishing or not, you must now wear a Type 1 Jacket (this includes Australia Standard AS 4758 or ISO 12402: level 275, level 150, level 100 or AS 1512). The only lifejackets approved for use in unprotected waters. DPIRD Fisheries and Department of Biodiversity, Conservation and Attractions (DBCA) officers patrolling the area, are reporting a good response to the trial from fishers and the local community alike. Those breaching the rules can be issued with an on-the-spot $200 fine or as much as up to $1,000 if prosecuted in court. DPIRD Fisheries officers and DBCA rangers showing visitors the kind of lifejacket that now must be worn by anyone going onto the rocks at Salmon Holes. For other lifejacket loan locations see this Recfishwest Safe rock fishing flyer. This could have ended in tragedy. Don’t put your life on the line fishing from the rocks unprotected. Photo courtesy of Recfishwest. Ideally – keep the sand between your toes and stick to the beach. Check the weather – use common sense and don’t fish in big swell. Know how to swim – if you can’t, fish from the beach. Fish with a friend and tell someone where you’re going. If rock fishing, wear rock boots and stay off the black rock. Wear a lifejacket if accessing a location where you could be swept into or fall into the water. For more fishing safety information, visit Recfishwest’s Fish and Survive website.